It’s my 26th game of 200 or better from my wheelchair with my IKAN Bowler®. It’s a pretty big deal when able-bodied folks bowl 200 or better for the first time. Mike’s 203 was bowled with friends and family on 3/11/2018. An added bonus for Mike is that he also became a category record holder, now having the top score for a wheelchair user who drives by head array control. He is also an IKAN Bowler® user, and the write-up sharing his category record is HERE. Mike is not the only new category record holder. Curt Wolff was one of the first nine members of the 200 Club, and he has worked to fine tune his bowling game for a number of years. 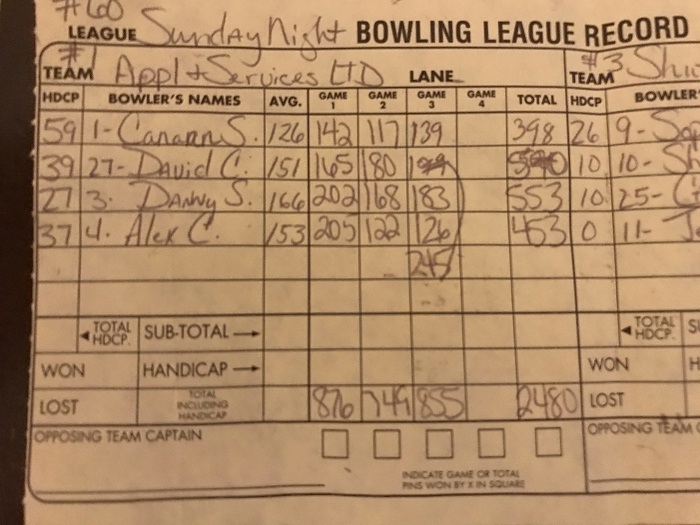 The results were spectacular on 3/8/2018 as Curt bowled a whopping 253, which is the best game to date for a wheelchair user driving by joystick. Click HERE for details about Curt’s record. Like I said when I bowled my highest game (a 255 that I am still in disbelief over)… to God be the glory! On Saturday, February 10, 2018, we are having the fourth annual bowl-a-thon to help keep my dear friend and fellow quadriplegic Rhonda Reese out of a nursing home. It is actually the fourth annual bowl-a-thon – but in five years! That is possible, because I can report GOOD NEWS! Rhonda now has 24/7 care through a combination of assistance programs, because she is paralyzed from the chest down and lost both her parents in 2012, and also it’s cheaper for taxpayers if Rhonda is able to stay in a community setting and in her apartment. And because of the coverage, Rhonda can stretch dollars farther (and we did not need to do a bowl-a-thon fundraiser in 2017). But there is a drawback to having 24/7 coverage… believe it or not, the shifts can be difficult to cover (likely due to a shortage of CNAs) and when a shift is uncovered, or somebody does not show up, Rhonda has to rely on and pay her small team of caregivers out of pocket. That’s why we need to have another bowl-a-thon. We are grateful for all shares, prayers, participants, and pledges/donations in support! And may God bless us all! I finally have all the results from the third quarter (Q3: July-August-September 2017) of our “IKAN Have Fun Bowling League” where wheelchair users (and friends or family bowling with them) can compete from anywhere in the world. If you compare the participation to our previous quarter (Q2) you will see that multiple folks were not able to participate as intended (myself included). But if you think about IKAN Bowler users being (primarily) people paralyzed from at least the chest down, it kind of underscores the fact that it is pretty great that we are able to bowl competitively in the first place.